3/3 What objective evidence do you have about the integrity of your clinical study data? The answer is three-fold (see posts 1/3 and 2/3 for the first two evidences). The third objective evidence that makes you confident that your car can drive you safely to your destination, results from the maintenance that you are delegating to your car dealer according to a predefined schedule.Your car dealer, hopefully a good professional, uses a control check list, specific to the model of your car, in order to perform the regular maintenance operations. A control check log, delivered after the car visit, allows to ensure that the maintenance has been completed satisfactorily. In the case where defects were identified but not repaired during the routine visit, your car dealer will advise you as regard to the risk associated with the defect, and provide you with a cost estimate and duration for immobilisation of your car. On this basis, you can decide when to engage the intervention. In a similar manner, the third objective evidence that your clinical study data integrity is under good control may come from the execution and reporting of a data quality oversight plan. The approach taken by “alcoam by design” is to initiate the data quality oversight plan by considering, in a holistic manner and in context of your study protocol, the overall framework in place for data quality production and control. From there, we ensure that the means and timing to detect and quantify data quality issues are appropriately defined and setup, and we document the outcome of this assessment within the data quality oversight plan (by who, when and how is the data quality and integrity controlled), and that root cause analysis and mitigation plans are defined upfront to address them as soon as they occur. 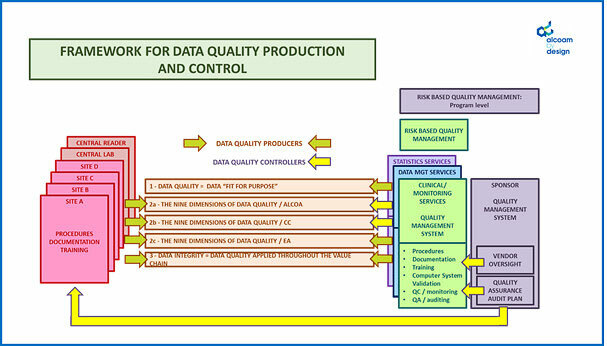 As a result of the execution of the data quality oversight plan, we produce a data quality oversight report summarising the outcome of the execution of the data quality checks at the predefined critical study milestones, as well as the actions taken to correct and prevent the data quality issues identified. The data quality oversight plan and execution reports fully integrate within any risk based quality management method in place for the clinical program, as recommended by ICH E6 Addendum R2.